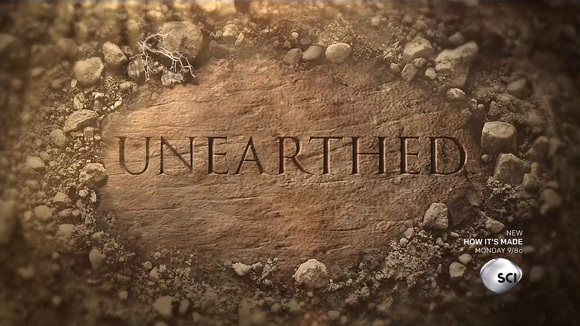 What’s in store for the new season of Unearthed? Science Channel just announced the premiere date for the TV show’s fifth season. The docuseries uses scientific investigation and animation “to unearth the hidden secrets of iconic monuments.” The new season will explore the secrets of Egypt, the Titanic, and Pompeii. Season five of Unearthed premieres on Science Channel on October 2nd at 10 p.m. ET/PT. (New York) – Digging up the deepest secrets of history’s great civilizations Science Channel’s top-rated archaeology series UNEARTHED is back with ten new episodes beginning Tuesday, October 2 at 10 p.m. ET/PT. Using scientific investigations and explosive animation to unearth the hidden secrets of iconic monuments, the series answers questions that have confounded experts for generations. Among the sites explored during the new season are Egypt’s Bent Pyramid, the lost city of Tikal, and Pompeii. Kicking off this season is an investigation into the Titanic and its infamous demise. It was a tragedy that shocked the world, but after more than a hundred years, the exact reason why it sank remains a mystery. UNEARTHED uses the latest technology and computer modeling to learn how an iceberg ripped open the ship’s colossal hull. Scientists smash ice into solid steel in powerful collision tests while nautical experts deploy advanced marine simulation technology to relive the massive ship’s fateful final moments. “Today’s technology is allowing scientists to research and figure out the secrets that have eluded their predecessors for generations. This series puts the spotlight on some of the remarkable work being done at some of the world’s most historic sites,” said Neil Laird, Executive Producer, Science Channel. Among the other site explored in the new season are the ruins of Pompeii, where new discoveries in an area that was previously off limits to research, reveal the horror of the cataclysm that wiped out the city. The Bent Pyramid in Egypt is one of the world’s most mysterious ancient mega-structures. Built by pharaoh Snefru, its shape puzzles archaeologists. Was this stra006Ege pyramid always intended to look like this or did something go catastrophically wrong? Hidden deep inside the Guatemalan jungle lies the lost city of Tikal, once the most important settlement in the Maya world, and home to over 100,000 people. How did this small jungle village rise to become a Maya superpower and what then transformed it from a thriving city into a ghost town? What do you think? Have you seen Unearthed? Will you watch the new season? More about: Science Channel TV shows: canceled or renewed?, Unearthed, Unearthed: canceled or renewed?